I’m not quite old enough to have lived through The Clash – I mean I did, but at the time they didn’t mean anything my 7-year old self – but even discovering them properly as I did some 15 years after their dissolution, it was obvious how powerful their music is and why you could argue the epithet, “the only band that matters”, still applies today. 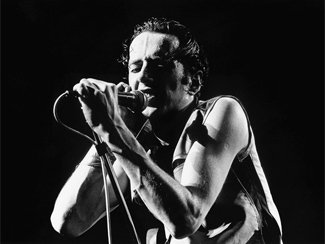 But I was never a Clash fanatic and so it’s just as well you don’t need to be to appreciate Julien Temple’s new documentary on the band’s late frontman, Joe Strummer: The Future Is Unwritten. Opening locally this Friday, it’s a fairly straight biopic tracking John Mellor’s life from his childhood through to becoming Joe Strummer and musical journey until his untimely death in 2002 of a heart attack. Opening powerfully with footage of a young Strummer tracking vocals for “White Riot”, Temple attempts to deviate from the standard video clip/talking head format by interspersing footage from films such as Animal Farm to illustrate the political climate in which Strummer grew up and also eschews adding the names of the onscreen interviewees as they relate stories about the man and his life. Sadly, neither of these devices helps the film at all. The former is both unnecessary and patronizing – the audience understands what fascism is without needing animated pigs to explain it – and the latter is just unhelpful. Except for the obvious appearances from the likes of Bono, Johnny Depp and Steve Buscemi, it’s frustrating to not be able to place an individual’s reminiscences into the context of who the hell they are. I can appreciate how the tactic was probably intended to level the playing field, to show that Martin Scorcese’s thoughts weren’t any more important than Joe’s old squatmate’s, but there’s something wrong when I couldn’t be sure that I was looking at Clash drummer Topper Headon until nearly halfway through the film. Those complaints, however, are minor relative to the film’s strengths, which lay simply with the subject matter. Joe Strummer was like a force of nature whether fronting his first rockabilly outfit The 101’ers, cementing his place in rock’n’roll history with The Clash or his late-life creative resurgence with The Mescaleros (whom I had the privilege of seeing at the Warehouse in Toronto way back in November of 1999) and Unwritten successfully captures that energy. And frustrating anonymity notwithstanding, the testimonials from friends, associates and followers which were shot around Strummer’s beloved campfires under the Brooklyn Bridge and on the banks of the Thames are genuinely moving and enlightening. The man’s flaws aren’t glossed over – blame for The Clash’s dissolution are laid pretty much squarely on him and his departure from and disavowal of the 101’ers and his lifestyle during that time is recounted in all its ruthlessness. But the overwhelming emotional content of the film is of affection and joy for Strummer, both the man and his music. And while it’s beyond understatement to say that he died far too early, at least there now exists a document and tribute as fitting as this one. Recommended for anyone who was a fan of The Clash, Strummer or just appreciates musical passion. As for Strummer’s co-conspirator in The Clash, Mick Jones has a new band called Carbon/Silicon and they released an album called Last Post last year. See and hear below. Bob Mould’s District Line is in stores next week and he’s at the Mod Club on March 10. Harp and Spin talk to the man about the new record. It takes a lot to get me to go to a show at the Molson Amphitheatre, but June 8’s bill of R.E.M., Modest Mouse and The National could well be enough. I’m intending on catching them at Stubbs’ on March 12 on the opening eve of SxSW so even though Accelerate isn’t out till April 1, I should know if this talk of them bringing back the rock – and we’re talking Life’s Rich Pageant-ry, not more Monster-osities – is for real or not. Billboard has full tour dates, Goldenfiddle has the artwork. Dean Wareham sits down and shuffles music with The AV Club. Dean & Britta are at the Mod Club February 9. Some good news/bad news for Neil Young fans who’ve been waiting patiently for the release of Archives for the past two decades or so – the good news is that the project hasn’t been abandoned and is still marching along at a snail’s pace (okay, that’s not really news). The bad news is that it won’t be released on CD – they’ve opted to put it out only in DVD and Blu-Ray formats. It’s not clear from the Billboard piece if that means two different-quality formats – standard DVD-Audio and high-capacity Blu-Ray – or HD-DVD and Blu-Ray, nuts to the regular ol’ DVD. Surely more details will be forthcoming before the now-projected October release date. Well look at it this way – all the old Rusties out there now have an excuse to go and get a PlayStation 3. And finally, anyone planning on going to the Sonic Boom in-store at Sonic Boom this weekend, be advised it’s been moved from 5PM on Sunday the 3rd to 7PM on Monday, February 4. The Saturday night show at the Silver Dollar is unchanged. Danu – the CFNY droog who introduced the film said that it was opening this Friday, and there were two rows of media-reserved seats that I assume were for local reviewers. So probably a limited run somewhere in the city starting Friday. RE: your MP3 of the week. It actually showed up earlier than Waydown; on the 30th Century Man EP (a New Years Eve release in ’92 I believe) which is well worth owning in its own right provided you can track down a copy. Covers of Scott Walker’s "30th Century Man," Mission of Burma’s "That’s When I Reach For My Revolver" and the Husker Du song as well as Catherine Wheel’s own "Free Of Mind." A wonderful EP.